where \(P_n\) and \(R_n\) are the precision and recall at the nth threshold . 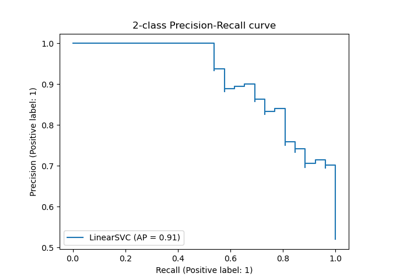 This implementation is not interpolated and is different from computing the area under the precision-recall curve with the trapezoidal rule, which uses linear interpolation and can be too optimistic. Note: this implementation is restricted to the binary classification task or multilabel classification task. True binary labels or binary label indicators. Target scores, can either be probability estimates of the positive class, confidence values, or non-thresholded measure of decisions (as returned by “decision_function” on some classifiers). Calculate metrics globally by considering each element of the label indicator matrix as a label. Calculate metrics for each label, and find their unweighted mean. This does not take label imbalance into account. Calculate metrics for each label, and find their average, weighted by support (the number of true instances for each label). Calculate metrics for each instance, and find their average. Will be ignored when y_true is binary. The label of the positive class. Only applied to binary y_true. For multilabel-indicator y_true, pos_label is fixed to 1. Changed in version 0.19: Instead of linearly interpolating between operating points, precisions are weighted by the change in recall since the last operating point.